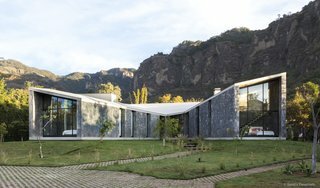 Located on the outskirts of Tepoztlán, an idyllic village about 37 miles south of Mexico City, MA House is an impressive residence whose design resonates with its mountainous setting. With four bedrooms, four-and-a-half baths, and boasting 4,865 square feet, the contemporary home is now a spectacular real estate offering with price provided on request. 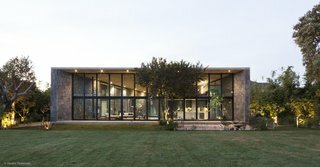 The home is an alternating series of open and enclosed spaces with ample glazing that provides plenty of natural light. 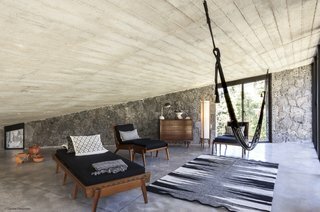 Cadaval & Solà-Morales, an architectural studio based in both Mexico and Spain, received the directive to use stone as the main construction material. This was less due to an aesthetic choice, and more so due to the abundance of stone surrounding the site, and the material's relatively low level of maintenance requirements and cost. All of the stone was sourced locally. However, the raw materiality of the material palette is undeniably captivating. 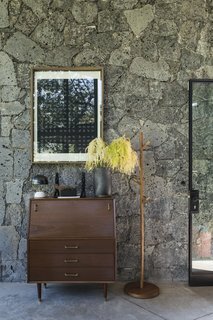 The striking design is a reflection of the home's lush location and the presence of the two surrounding the mountains of Tepoztlán. 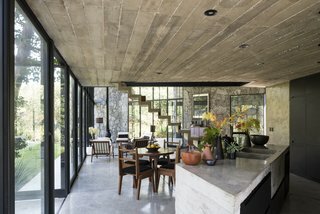 with The texture of the rough and imposing building material ties the home to its site, and successfully reinforces the ever-present sense of the power of nature. 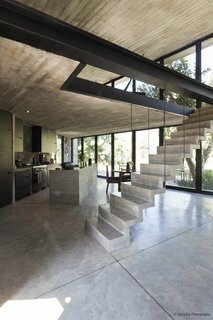 The main living area features a full-glass frontage facing the mountains and a cut stone stairway leading to the mezzanine level. The mezzanine level provides a relaxing space for lounging. 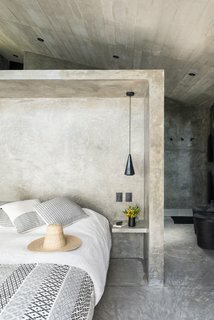 The bedroom is a good example of the minimal interiors featured throughout. 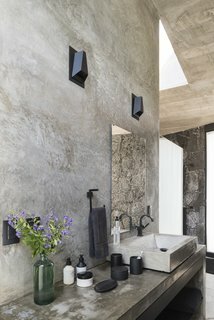 The raw materiality of the interiors is reflected in one of the bathrooms. 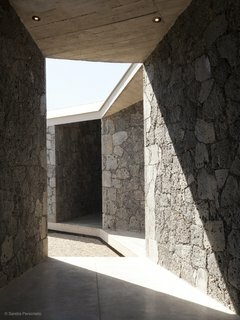 The diagonal patios and sloping roof create angular shadows. The house is a succession of three pavilions unified by a unique roof, and includes two covered patios. The roof is continuous and rests on top of the structural stone walls. 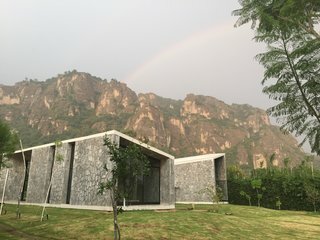 The design reinforces the beauty of the site and the power of nature. The MA house is for sale. Please email casamatepoz@gmail.com for more information or make inquiries through the architect.